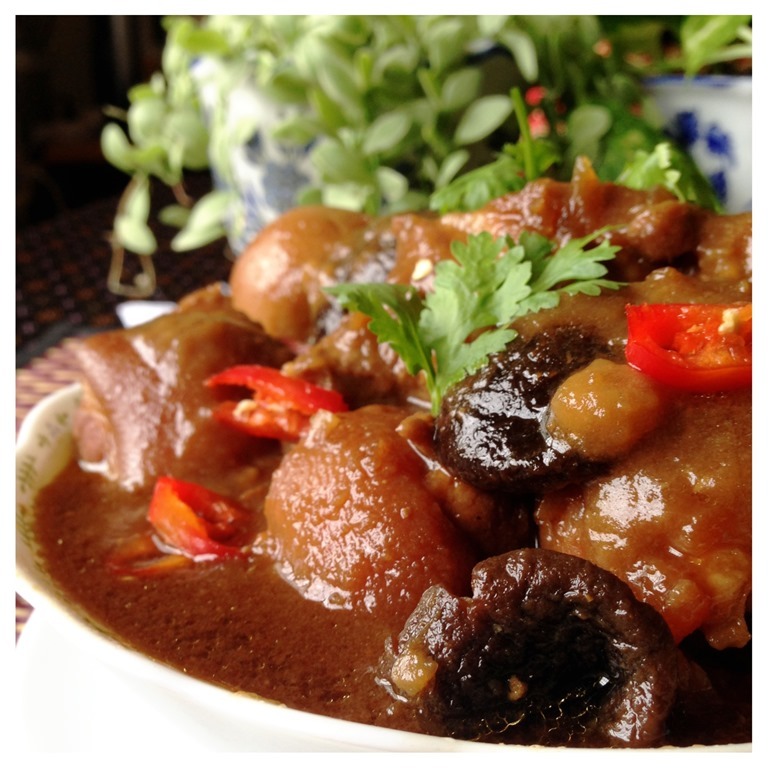 I have prepared some meat pongteh last night and quite a lot was left. My wife said that the sauce were nice to eat with noodles and I concurred. 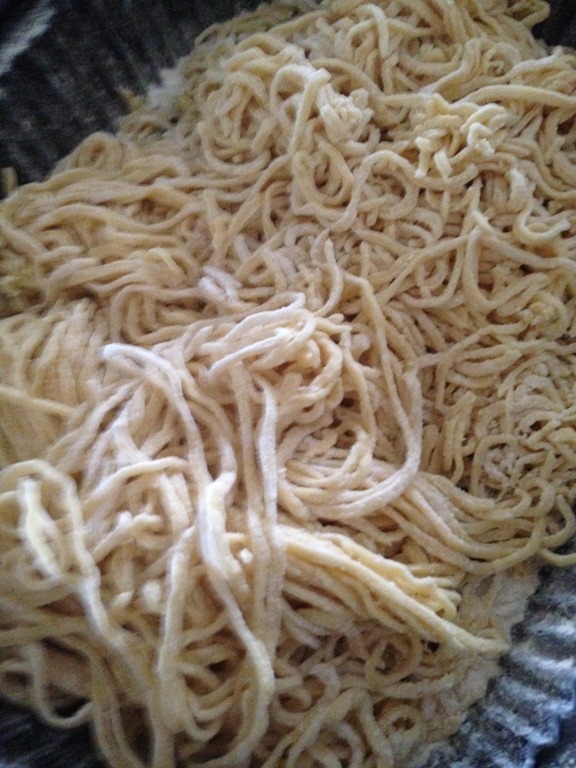 In the next morning, I prepared some egg noodles. 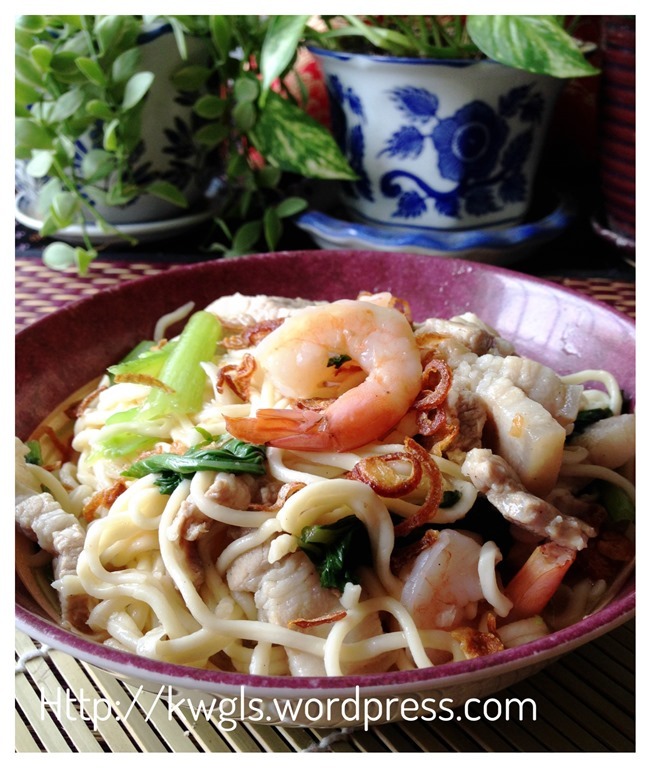 I blanched the egg noodles and used them to cook this simple braised noodles. 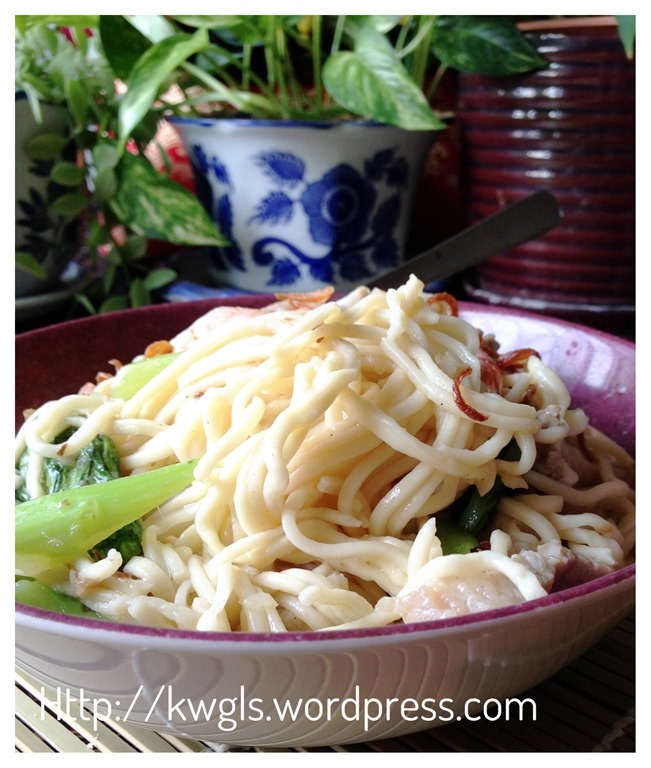 As I have quite a noodles left, I stored in the fridge and I used these blanched noodles to prepare some stir fry noodles for my kids 2 days later. 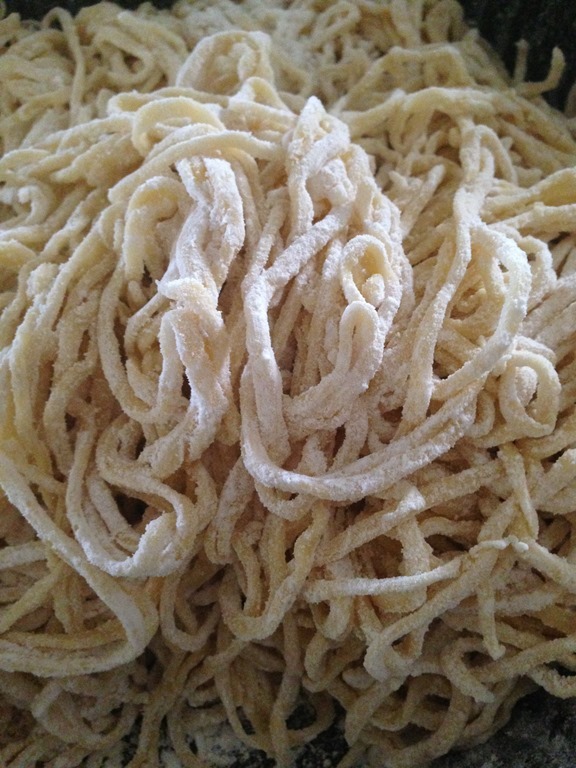 Most egg noodles recipes are the same.. nothing to shout about.. 1 cup of plain flour with 2 eggs of about 50 grams of each and you will be surprised that these egg noodles is the same recipe as for Western spaghettis. I am sure I need not to elaborate any further about these egg noodles since it is a common staple item in Asian households. 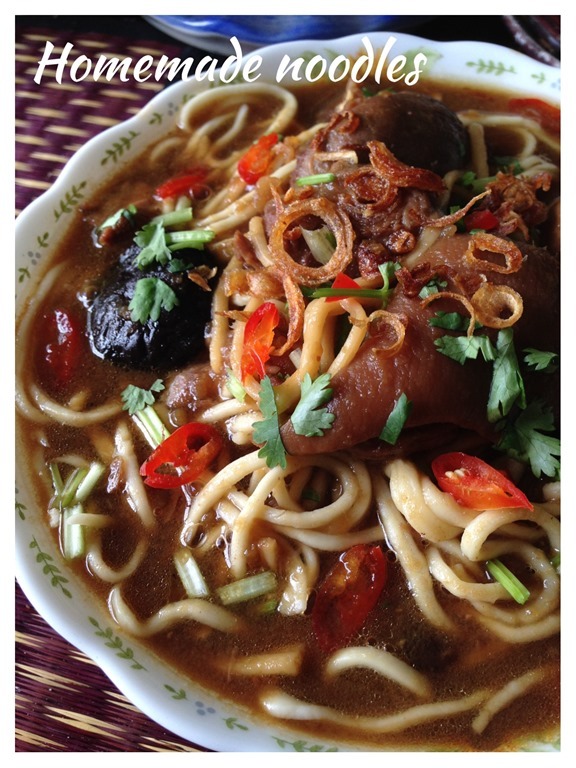 However, it is no harm to understand what Wikipedia have defined these noodles. 1 cup of plain flour (or other types of flour such as wholemeal flour) that you prefer. 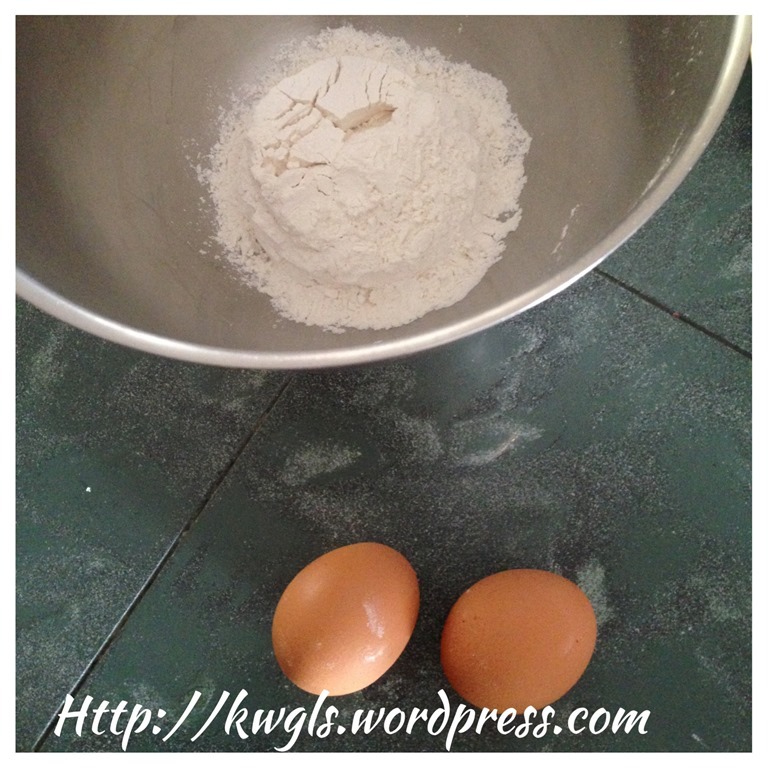 Put eggs and flour in a mixing bowl. 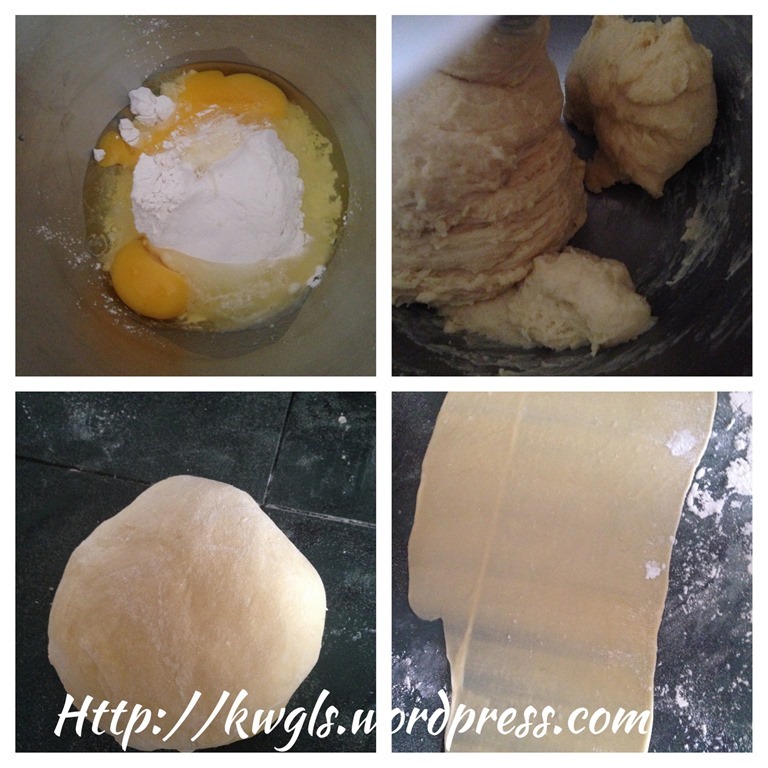 Use a standing mixer to knead until it become a pliable dough. If the it is too dry to form a pliable dough, add in milk or water tablespoon by tablespoon. The dough should be rather soft and comfortable to touch. Once done, let it rest for 45 minutes to one hour before rolling or cutting. Cover the dough with some clingy wrap. If you do not have a standing mixer, just use hand to knead. As long as it form a pliable dough and do not stick to your hand, it is acceptable. Once done, divide the dough into small chunks. Use the noodle machine to roll it as thin as you would like. In this case, I use no. 5 to roll the dough into flat piece. Dust the flat dough with some flour and transfer the flat dough to the noodle cutting section. Cut the the dough using the machine and dust with additional flour. 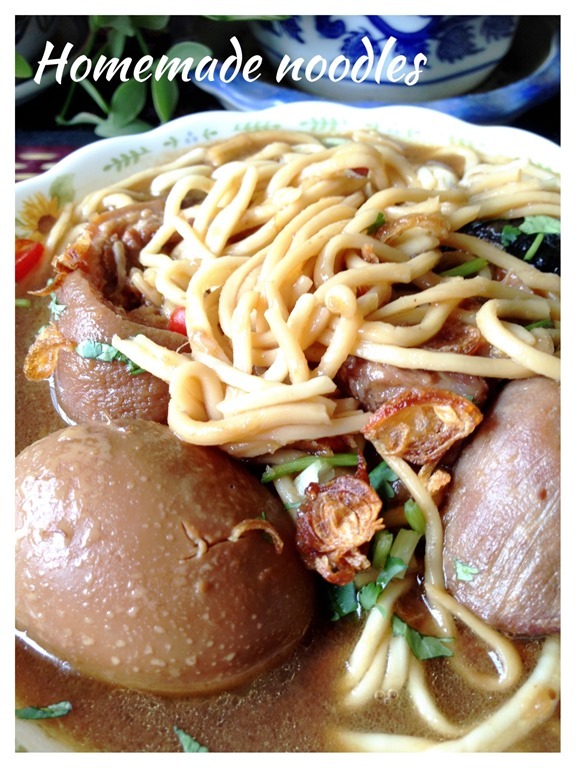 It is best that you hang the homemade noodles using a stick to avoid sticking to each other. However, as I do not have such stick, I just placed it in a container. If it is too sticky to roll the dough, pat the dough with flour until it is can be rolled and cut. Experience shows that one needs quite a lot extra flour to facilitate the rolling and cutting. 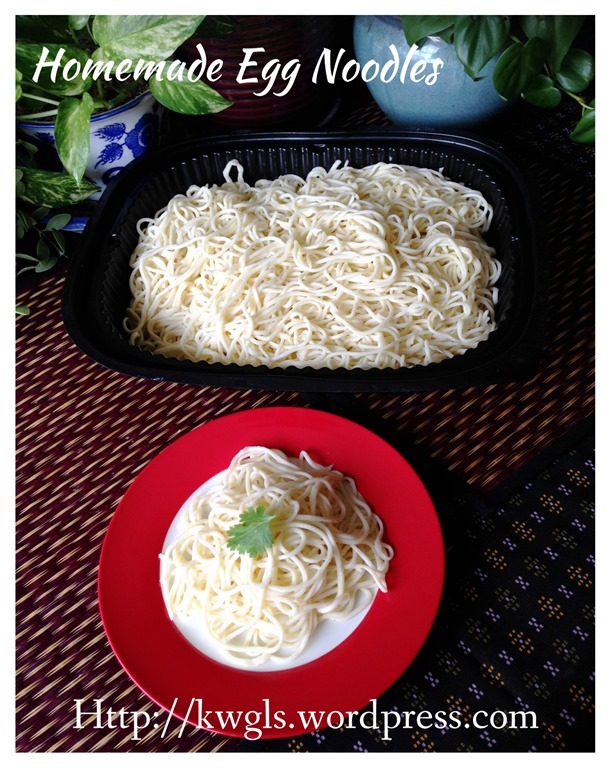 Once done, you can either keep the noodles in an air tight container or air/sun dried. However, I personally prefer to blanch the noodles in a pot of water with 1-2 tablespoons of cooking oil. Once the noodles are in the hot boiling water, use few chopsticks to tear apart the noodles to prevent them from sticking together. Once cooked, drained and put in icy cold water for about 5 minutes to avoid sticking to each other. 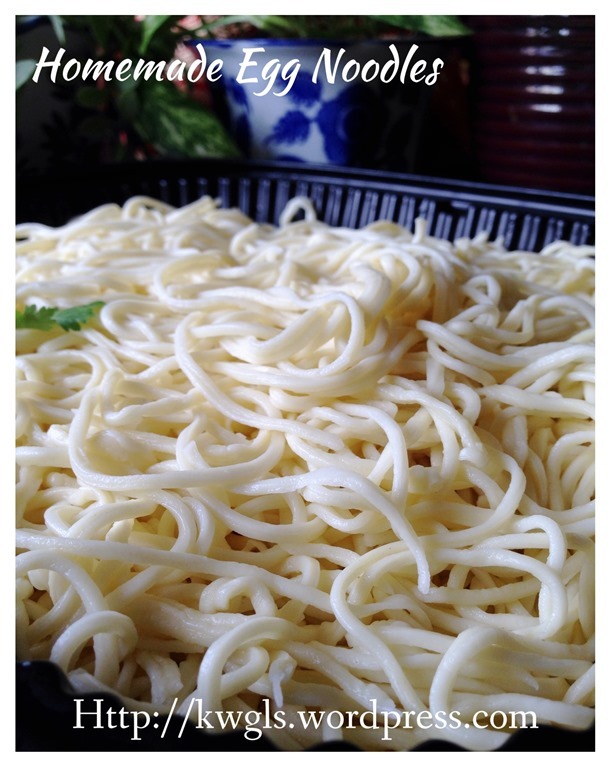 Once the noodles cooled, keep it in an air tight container and in the refrigerator. This is the basic noodles recipe and if you want it to be more springy or chewy, you can reduce the egg (liquid) slightly. The less liquid in the dough, the more chewy it is. 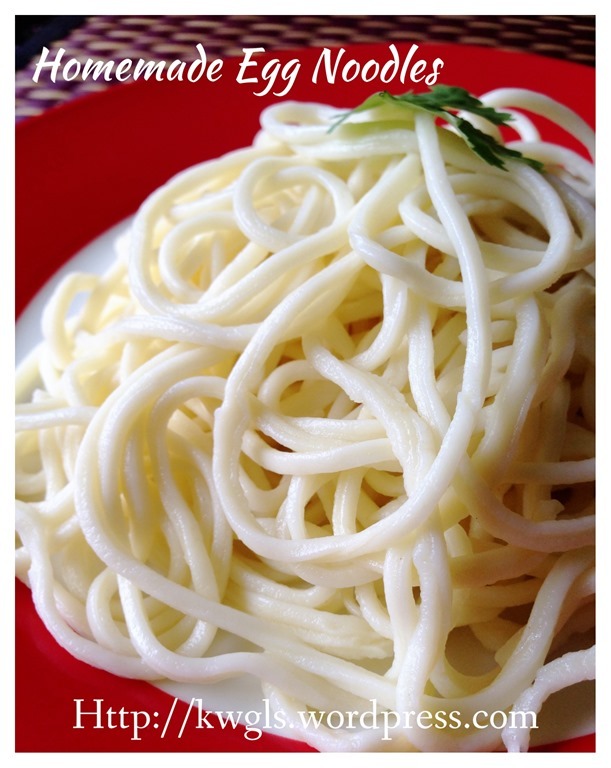 If you like soft noodles, you can add a few more tablespoons of water . However, the softer the dough, the more difficult for it to be rolled and cut. 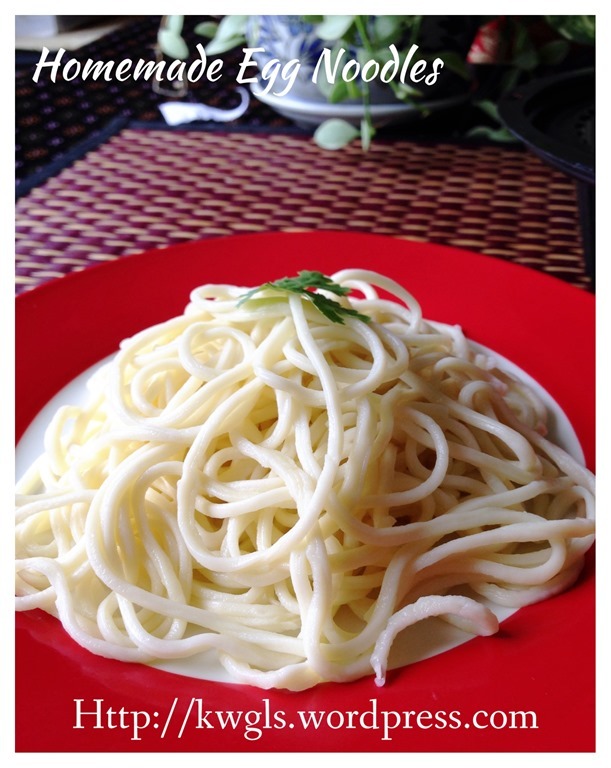 If you prefer, you can add in some alkaline water (1 teaspoon of alkaline water with 1 cup of flour) to enhance the stretch ability of the noodles. If you are vegetarian, instead of using eggs, just use plain water (about 100-120 grams of water as per above recipe. If you want to have a stronger egg fragrance, substitute one whole egg with 2 egg yolks in the above recipe, your noodles will be more aromatic and yellowish. 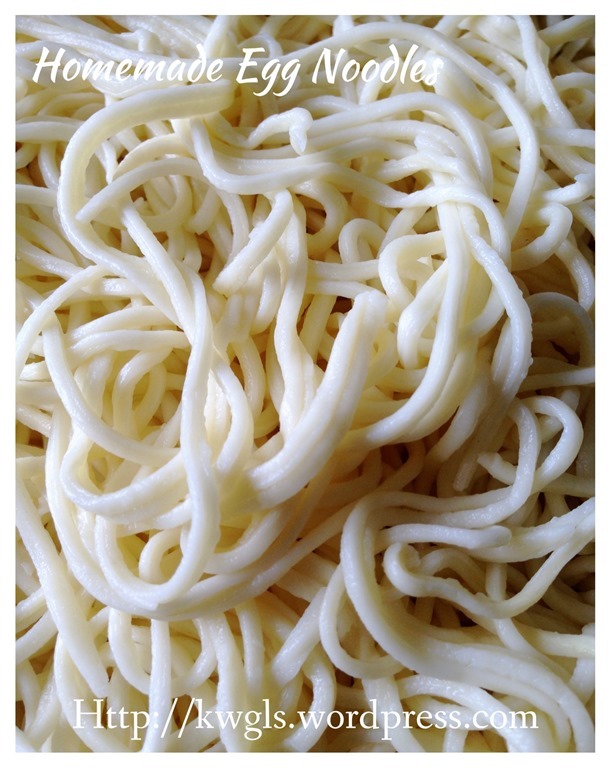 If you do not have an noodles making machine, just roll the dough flat using a rolling pin and use a sharp knife to cut the rolled dough. If you like spinach noodles, substitute part of the liquid with spinach juice.. 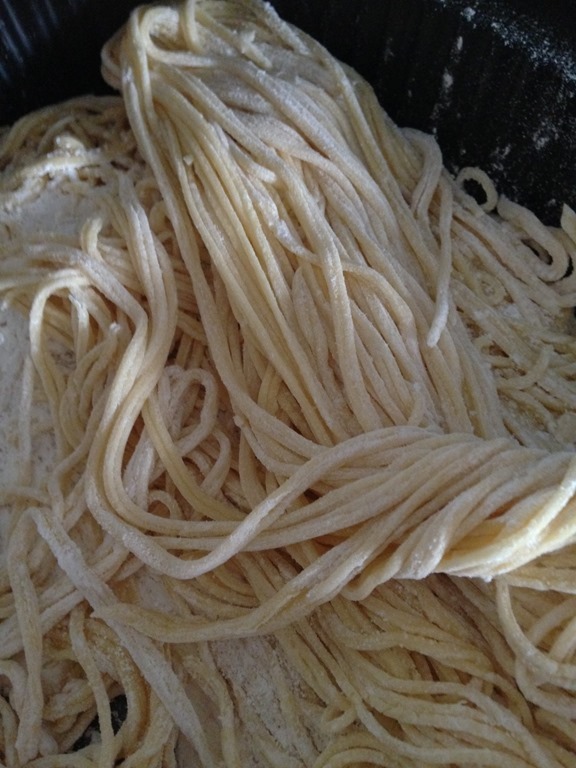 If you like wholemeal noodles, use wholemeal flour for the preparation. Variations are many. 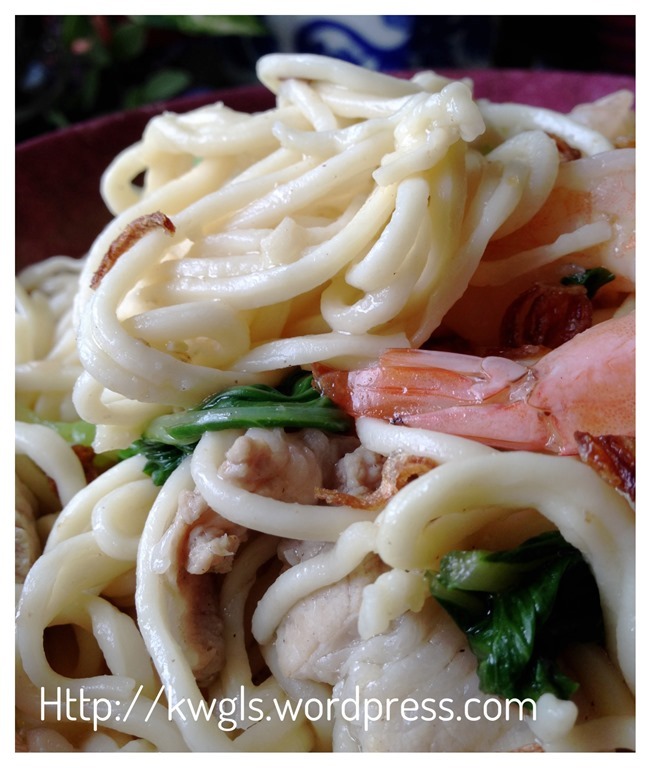 It is not difficult to prepare noodles at home. Of course with the noodle machine, life will be much easier. It cost me about SGD35 to get hold of a machine. 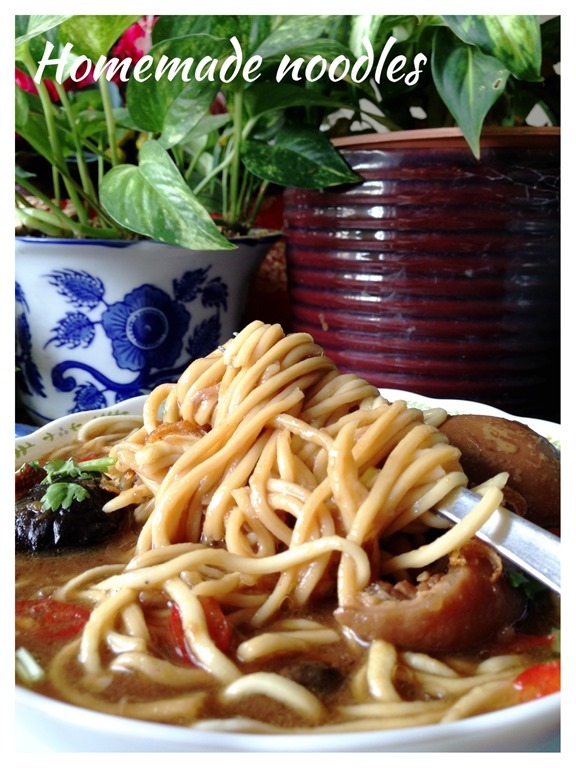 Don’t be deterred if you do not own one, families in many part of China are using knife to cut the noodles.. Why don’t you give it a try? 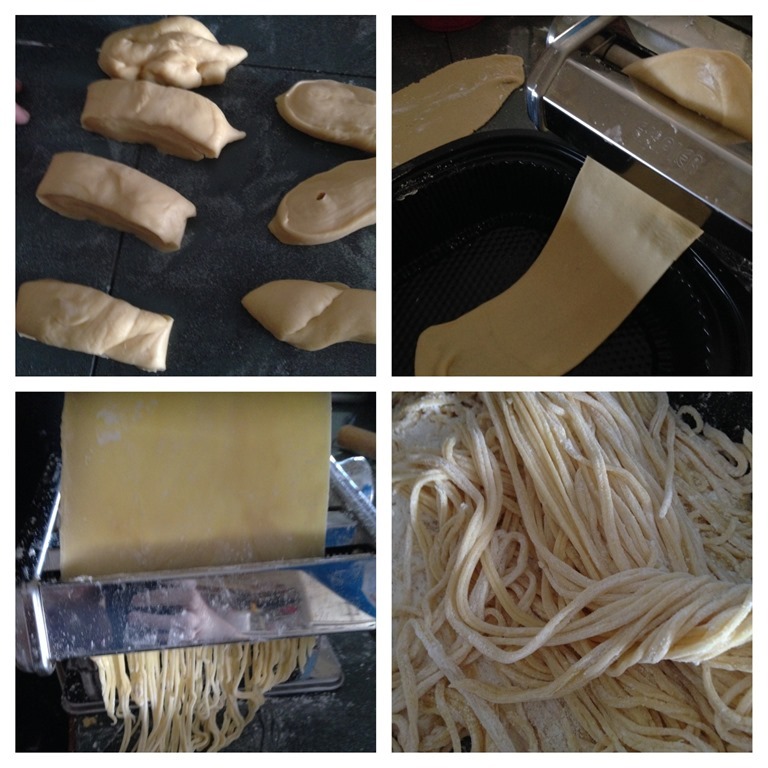 This entry was posted in Chinese and Asian Cakes and Snacks, Food Preparation Series and tagged 8, Egg noodles, GUAI SHU SHU, Guaishushu, homemade egg noodles, homemade spaghettis, kenneth goh, postaday. Bookmark the permalink.